Looking for Planning and Zoning Applications or the Town of Chester Zoning Local Law? Click Here. To view the most recent Tax Map Parcel Data for the Town of Chester through the Warren County GIS Program, click here or visit http://www.warrencountyny.gov/gis. 1. 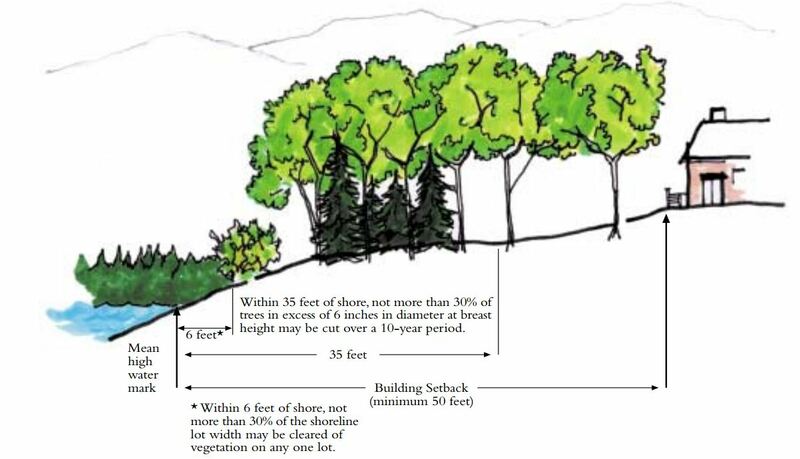 Within 35 feet of the shoreline no vegetation may be removed, except that up to a maximum of 30 percent of the trees in excess of six inches diameter at breast height (DBH) existing at any time may be cut over any 10-year period. addition to the general standards above. 3. The above cutting standards shall not be deemed to prevent the removal of diseased vegetation or of rotten or damaged trees or other vegetation that presents safety or health hazards. Photo courtesy of the Adirondack Park Agency. Please click the above image to enlarge.